Ron Ayers, the chief aerodynamicist of successive LSR attemptsThrust SSC and Bloodhound SSC, explains how record breaking has developed in recent years. I first met Richard Noble in 1992. He was then the holder of the World Land Speed Record, having achieved a figure of 633mph in 1983 in Thrust 2. On learning that I had an aeronautical background, and specialising in high speed aerodynamics, he asked me to help him create a car to travel at supersonic speeds. My initial reaction (caused by ignorance of the effects of shockwaves at ground level, and the impracticability of having 800 mph rolling roads in wind tunnels) was a strongly negative one. It was only after considerable thought that I told Richard that these problems could just conceivably be overcome. Even this modest reduction of pessimism was sufficient for Richard to introduce me to Glynne Bowsher, an experienced mechanical engineer who had previously worked on Thrust 2, and we commenced designing. The team was subsequently augmented by Jeremy Bliss, who had extensive experience as a systems and suspension designer for the McLaren F1 team. Having no automobile engineering experience, I needed to find a starting point so I looked at LSR history. Clearly there are two separate records – wheel driven and jet/rocket driven. (Note: Blue Flame, a rocket car, has been included here for completeness). From the first jet car record (407.45 mph in 1983) to the breaching of 600 mph took only 833 days. The percentage increase over subsequent decades has been very modest indeed. This curve looked to me like a barrier to further progress. In short, my target of 800 mph did not look achievable by simply using a ‘jet on a trolley’. Use rocket propulsion. Blue flame clearly had not achieved its full potential so this was a possible route. Unfortunately I did not have access to rocket technology at that time. A pair of Rolls-Royce Spey 202s was available for a few thousand pounds, so this was our chosen solution. These amazing engines ran 66 times, often ingesting sand, and never once presenting us with the slightest problem. The layout of a single engine jet car presents the problem of where to locate the driver. He can hardly sit astride the engine like a jockey, so the unattractive choice is between driver-out-front as with Spirit of America (driver very exposed), and driver-on-one-side as with Thrust 2 (big vehicle frontal area). With two jets the solution is obvious. The driver can be located at the vehicle’s centre of gravity and protected by the enormously strong steel structure holding the two engines. The ratio of jet intake area/total frontal area is also much greater than for single jet layouts, with obvious benefits for performance. For structural reasons the engine mass had to be supported either by the front wheels or the rear wheels. 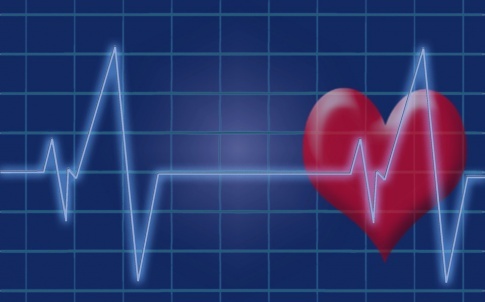 Benefits, and problems, could be seen for both layouts. As our design team was so small, two unfunded people at that stage, we could only explore one option and had to make a choice. Our chosen layout, of mounting the engines over the front wheels, had immediate benefits with regards to stability but necessitated the use of rear wheel steering. It also exposed the rear body panels to the jet efflux from the two jets. These problems did, indeed, subsequently prove to be severe. Rear-mounted engines have avoided these problems, but would we have encountered stability or other difficulties instead? We will never know. The problem we had to explore was that of trans-sonic ground effect. We could not do that using a wind tunnel as such tunnels could never be fitted with an 800 mph rolling road. Swansea University agreed to use CFD. Their Cray computer, state-of-the-art at that time, could process one million space elements which proved to be just sufficient to handle symmetric configurations in inviscid flow. The following is a pressure picture produced in 1993 – long before anyone else was using CFD for design purposes. The strong shock wave visible across the middle of the body subsequently immortalised itself on Black Rock Desert with the following picture taken from a microlight. My problem in 1993 was that no-one else had ever trusted CFD for design purposes. Indeed, the opinions I received were of the type: ‘Oh yes, we tried it once and the results were rubbish so we have ignored it since’. As Thrust SSC was the ultimate safety-critical project, I had to find some method of validating the CFD or we could not proceed. 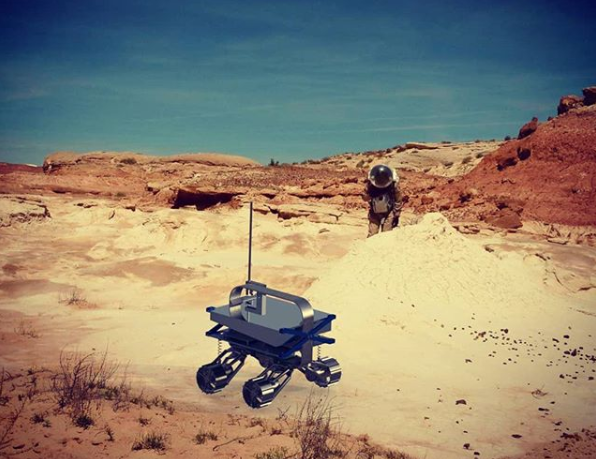 We designed and made a 1/25th scale model and instrumented it with high frequency pressure sensors. This model was accelerated from rest to 800 mph in 0.8 seconds, using a battery of rockets. Amazingly, the results of this pioneering CFD correlated very well with the pressure readings from these rocket tests. Independent experts confirmed that the accuracy of CFD had been reasonably established so we could use it for design work. 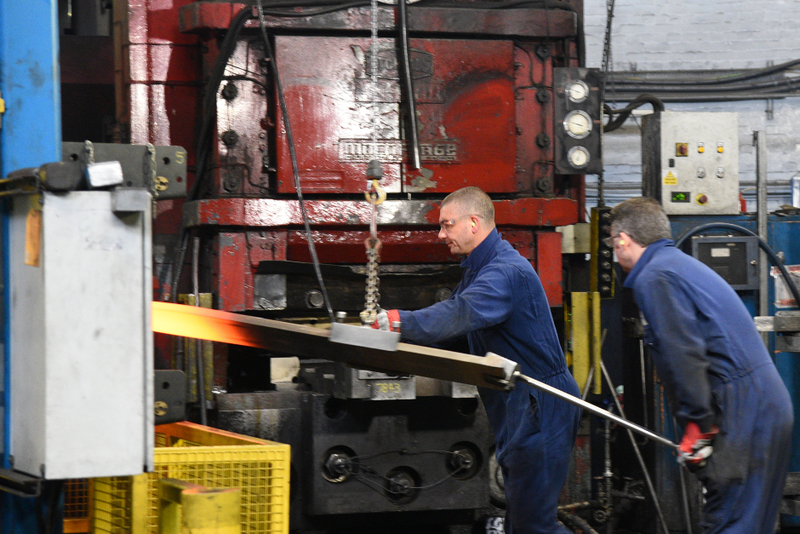 CAD systems introduced enormous flexibility into the design process by enabling many design options to be considered before cutting metal. I believe Thrust SSC was the first WLSR vehicle to benefit from this. 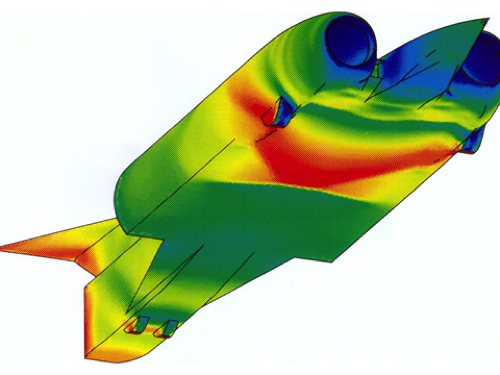 Computational Fluid Dynamics (CFD), after being validated by our Pendine rocket sled experiments, could be used to explore transonic ground effect and define the outside shape of the vehicle. Spreadsheets enable very detailed analyses of vehicle performance which can be constantly updated to incorporate the latest design changes and environmental factors. We demonstrated this by our driver (Wing Commander Andy Green) driving Thrust SSC up to sonic velocities and then bring the car to a stop with the wheelbase spanning the designated turn-round point 13 miles from the start. Thrust SSC logged readings from over 120 instruments, enabling detailed analysis of the factors influencing performance and contributing to increased safety. Bloodhound SSC will have over between 500 and 600 instruments, and up to 30 on-board cameras, recording every aspect of vehicle operation. These will be simultaneously transmitted live by 500 HD channels even when travelling at supersonic velocities. 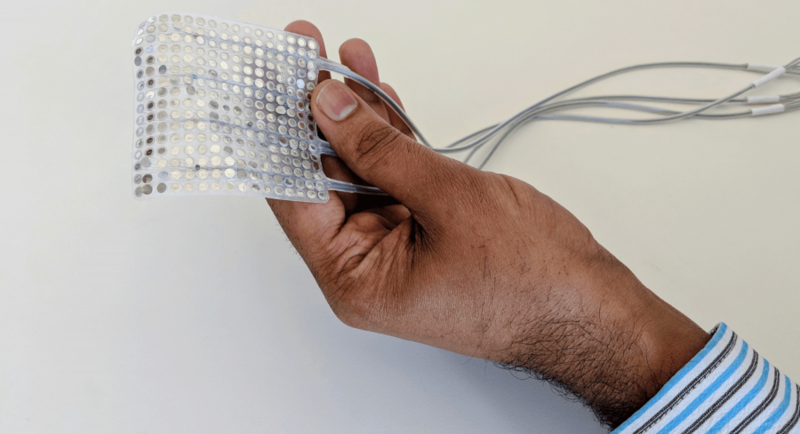 This real-time condition monitoring will further add to the vehicle’s safety. 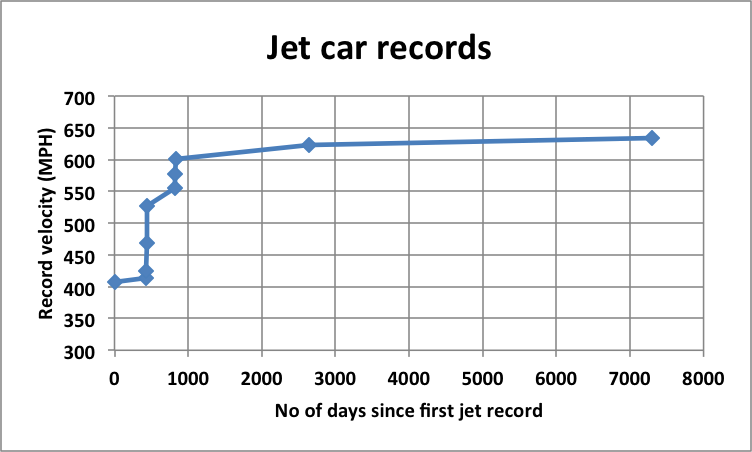 The 1st jet car record was set in 1963 not 1983. 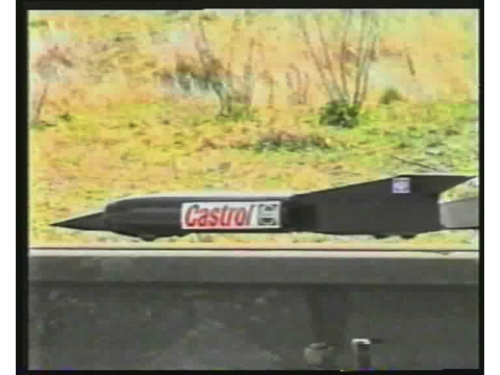 I remain convinced that the reason Thrust SSC broke the record and Spirit of America (with a much greater budget) didn’t is because Ron ran it as a proper engineering research project. Sadly I was only a member of the supporters club, but proud I at least had that vicarious participation. Obviously I’m a member of the Bloodhound SSC supporters club and hope the fact that they are taking the same approach is giving school children an understanding of how these things should be done. I would like to clarify a few things about the 1997 Landspeed record. First off my congratulations again to the Thrust team. But I want to share some facts and observations. The Spirit of America design was a sound one and totally capable of setting the record but as the old saying goes” It’s better to be lucky than good some days ” applies here ! First off due to bad luck the SOA vehicle destroyed an engine during parachute test and run ups. During those test it was impeccably stable and progressing as planned but unfortunately some debris when through the engine necessitating and engine change. It was during that down time Thrust had unchallenged access to the Black Rock desert. They took full advantage of it and as their good luck would have it they ran up to a record setting speed just ahead of a rain storm but, not without their own problems. At the completion of the 763.035 average mph run I stood next to the car watching the titanium panels protecting the body from the jet exhaust form cracks all across it ! There was not another run in that car without some repairs. It didn’t matter anyway because it started to rain and it rained for over a week straight. Thrust packed up and the SOA team camped there hoping for a break in the weather and an attempt at the record. It never came. After two weeks, I made my early morning trip out to the playa to examine the surface and found a river had formed through the middle of the measured mile ! The season was done ! 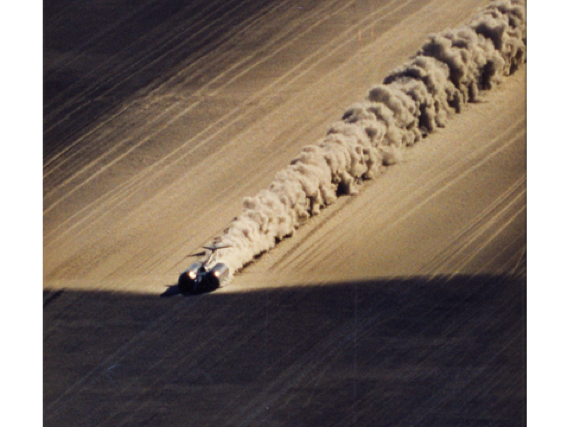 And to add further insult to the story the Black Rock Desert surface due to weather patterns has never been in runnable condition for a supersonic vehicle since ! Because the late Walt Sheehan can’t speak for himself, it falls to me to report what he told me about the Spirit Of America (SOA) destroyed engine. For those who do not recognize the name, know that it was Sheehan who took Breedlove’s ideas and engineered them into workable existence giving the USA 5 World Land Speed Records in 5 years. According to Sheehan, whom I tracked down at a motel on his way back from Black Rock Desert, the destruction was imminent because “the group of people” were not working as a team and were repeatedly careless with the intake nacelles, often stuffing the spent parachutes into the port and starboard openings as they towed back to the pit area. Anyone who works with jets knows protecting the intakes form foreign anything is paramount to safety operation. Sheehan explained to them why this practice was dangerous and then berated them when they ignored his counsel (imagine Andy Green blowing off Ron Ayers) which resulted in his room being emptied and given to friends of a crew person. Sheehan, more than 70 at the time, and battling cancer, was told he could find his belongings in the metal, dirt floor Quonset hut where he could sleep if he felt the car needed so much protection. So there he went, the man from Lockheed who had designed the F104 Starfighter intake ducts as well as every one for SOAs through the years. When Breedlove said nothing about the lackadaisical car treatment, Walt packed up and left. Breedlove’s third jet car could have easily snagged the World Record if he would have given the operational authority to someone who knew what they were doing. Noble’s record was a mere 633MPH and anything north of 650 would have reset game immensely. Instead, that gorgeous svelte white arrow of a car can only claim to have the “World’s Fastest U-Turn” and “World’s Longest Skid Mark” earned the year prior when Craig performed the most elegant ballet 1/4 roll and righting at 675MPH (missing a local spectator’s pickup by a few feet) because the near same group of inexperienced people (again from Sheehan) reported the cross wind was 1.5MPH and not 15MPH at the hot section of the course. After he died, Sheehan’s family gave me nearly all of Walt’s documentation from all three SOA cars and that of Mickey Thompson’s Challenger – the car son Danny has resurrected in hopes of claiming the World Wheel-Drive Record earned by Don Vesco at 458MPH. I send Danny everything Walt had saved and brought the 3-wheeler car documentation to the curator Chicago’s Museum of Science & Industry where the car was exhibited for decades. I still have everything else. Had Craig hit ANY mark in 1996, the British would have landed in the USA chasing the Absolute Record, not still owning it. The psychological aspects of that alone can be a prophetic game changer. It is my opinion the SOA team squandered its advantages, not only because of what Sheehan told me, but also by two months of first-hand observations living on the Black Rock Desert on assignment for 15 news outlets including Sports Illustrated, Chicago Tribune and the London Daily Telegraph. This perspective was confirmed years later when Craig and I sat down for a long-overdue “debrief” about 1997 debacle. You could not help but be awed by the operational precision and resolve of the 1997 UK team. I remain ever their admirer for what they accomplished. I also ardently believe American engineering talent could certainly best them, but the will to do so simply does not emanate from within our shores. What we need is the American version of the unstoppable British secret weapon of a project leader, aka: Richard Noble. Attention John Force! Your country needs you!